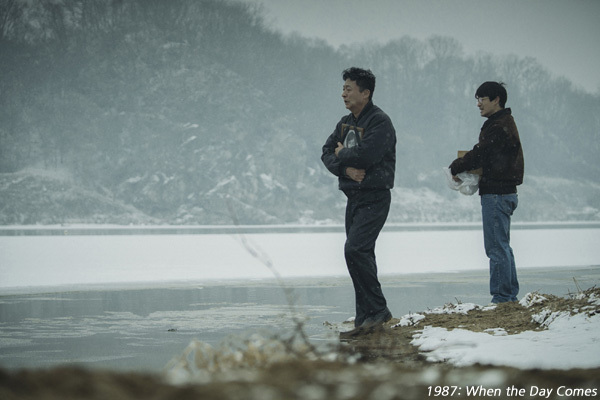 Political drama 1987: When the Day Comes (2017) took the top prize at the 9th edition of the Korean Film Reporters Association Awards. In addition, the film also took the prize for Best Director, which went to JANG Joon-hwan. The last film released in 2017, 1987: When the Day Comes focuses on the events that led up to the June Democratic Movement in Korea. It became a steady hit for CJ Entertainment, welcoming in excess of seven million viewers. SUL Kyung-gu earned the prize for Best Actor for his part in Memoir of a Murderer (2017), while NA Moon-hee earned Best Actress for I Can Speak (2017). THE OUTLAWS (2017) actor JIN Seon-kyu took home Best Supporting Actor, with The King (2017) star KIM So-jin earning the Best Supporting Actress accolade. In the rookie acting categories, it was PARK Seo-jun and CHOI Hee-seo who took home the Best New Actor and Actress prizes, for Midnight Runners (2017) and Anarchist from Colony (2017), respectively. CHO Hyunhoon was awarded the prize for Best Independent Film, for his critically-acclaimed debut Jane (2017) and Christopher Nolan’s Dunkirk (2017) was recognized as the Best Foreign Film. KIM Yong-hwa, director of the blockbuster hit Along with the Gods: The Two Worlds (2017), was awarded the Film Person of the Year Prize, while THE OUTLAWS (2017) lead YOON Kye-sang took home the Discovery of the Year accolade. Finally, the Marketing Award went to CHOI Joon-sik of Lotte Entertainment while the Best Reporter Prize was given to KIM Ji-hye of SBS Medianet.